There are few things as elemental as bread. And yet there are few things as hard to find in Miami as a great loaf of bread. For me, that changed when I discovered Zak the Baker. For the past couple years, Zak the Baker (a/k/a Zak Stern) has been making beautifully simple natural leaven country bread. I got turned on to Zak's bread via Chef Michelle Bernstein, who has been serving it at her restaurant, Michy's. I rejoiced when my CSA farmer, Muriel Olivares of Little River Market Garden, started selling it on Saturdays at the Upper Eastside Farmers Market at Legion Park on Biscayne Boulevard. His bread is almost intensely crusty, its interior crumb is pocked with big airy holes, its flavor is hearty and rich. His bread has character, maybe even - dare I say it - soul. (You can read more about Zak and his backstory in this feature in Edible South Florida, or this profile in Miami New Times). For me, these are the kinds of things that elevate a food community: the folks who dedicate themselves to a particular craft, who focus on making one thing as best as they possibly can. Miami has plenty of glitzy restaurants with multi-million dollar investments behind them. It is still very much a work in progress when it comes to the network of farmers, bakers, butchers and fishmongers who can supply both restaurants and individuals with great products. Sometimes, your community is what you make it. Here is one of those opportunities. With a week to go, Zak is more than 75% of the way to the additional $30,000 he is hoping to fund through Kickstarter. I don't normally use this platform for these kinds of purposes, but I'm doing so now: please help. Most of the physical space, and most of the operation, will still be dedicated to Zak's wholesale business. 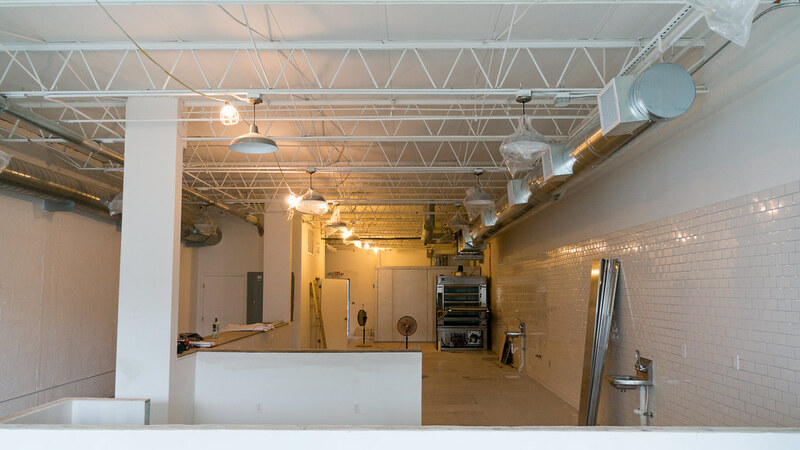 "This will be a bakery before it is anything else," he says. Though it may still look much like an empty shell, the bulk of the work has been completed. All the basic infrastructure is in (the decidedly unglamorous stuff like grease traps and ventilation), and a gleaming new (and phenomenally expensive) Empire Stone Hearth oven is ready to be fired up. 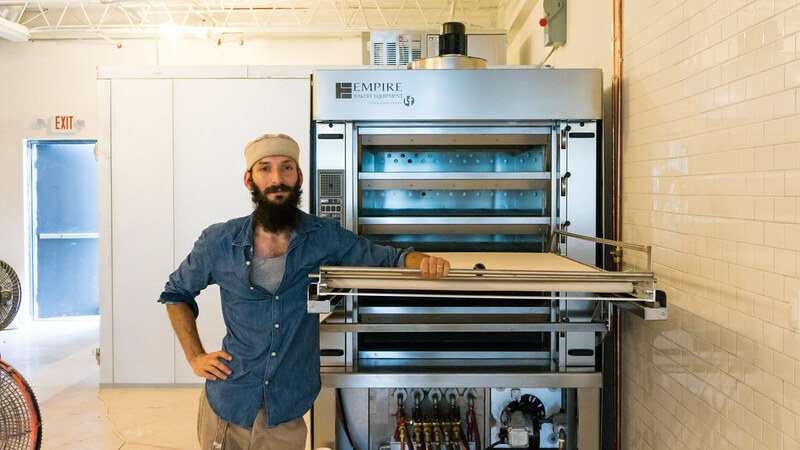 Though the new oven has an integrated loader to make it easier to get loaves in and out, each will still be made by hand, the same way Zak's done since he started. In front will be a counter for retail sales and the café, which will have a daily menu listed on the wall. Expect it to be short and sweet: "Here's what we have today," in the style of Chez Panisse. The chef, Sasha Ariel, comes by way of Michy's. Jason Schaan, Michy's chef de cuisine, put them together, calling Zak to tell him: "I've got someone here, she's Jewish and she loves goats." It was an unusual recommendation, but Zak says she turned out to be perfect for the job. Seating for the café will be primarily along a counter that stretches in front of the bakery area. Don't expect much else in the way of decoration: Zak hopes the activity of the open prep area provides enough entertainment for the customers. Muriel will be helping set up a garden behind the property, in a wide, sunny strip between parking lots owned by the landlord. It will supply the greens and some of the vegetables for the café. The bakery will be pareve kosher, and the café will be dairy kosher. 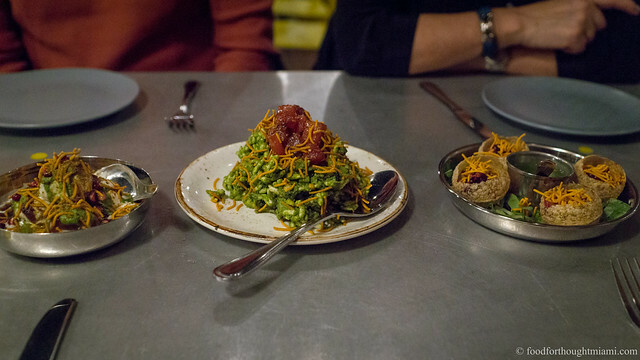 Though Wynwood is not exactly a bastion of observant Judaism, this was a personal choice because, Zak says, "my wife is religious and she wanted to be able to eat at the café that she's an owner of." This means at least a few things: the café will be closed on Saturdays; virtually all the products for the café will be prepared in-house ("If there's salmon in a sandwich, it will be smoked or cured by us. "); and, just maybe, the place may serve as the crossroads for a variety of different communities. As Zak puts it: "I'm interested to see what happens when the hipster, foodie and Haredi communities come and mingle. It happens in Brooklyn; it doesn't happen so much here." Thank you so much for sharing this with us! Love Zak and love his bread. I am proud to be a Zak the baker kickstart supporter. I have passed it on to my friends. Miami needs more of this.